Life, Laughter and Paris: Well YUCK! Several mornings now we've been treated to a new "present" on our deck (and no, it's not a poop deck). Happy? Uh...no. Not only the info, but pictures, so there's be no mistake! Of course identifying the visitor doesn't really help. This has to stop! 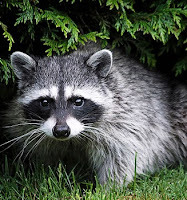 It's getting so I'm afraid to go on the deck after dark in case the raccoons are there with their little raccoon toothbrushes getting ready for their nightly ablutions. Sure they're cute - but cute somewhere else. It's odd because I wrote about this sort of thing last year and I see it was on July 15. I wonder if they use our place for their summer vacation? Are we the Riviera of the raccoon world? Do we advertise great bathrooms? I don't know why they come to us. There's not a speck of food or garbage on our deck, only a few flowers that they've dug up a few times. So....tonight we leave the outside light on. I've sprayed all around with a strong smelling cleaner.....I hope they get the message. The next step is waiting up all night and screaming at them (apparently they don't like that - neither do the neighbours). In case you need to identify the same problem- photos. Don't look unless you have to......again, UGH! Photos are really gross.